With the advent of silicon-controlled rectifiers, the importance of the dc machine as a generator has considerably reduced as SCRs can be employed to draw dc power from standard ac supply and convert it to dc; also the dc voltage can also be varied with ease. 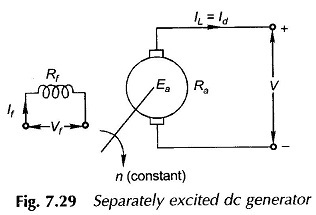 For the sake of completeness the characteristics of dc generators will be briefly discussed here, which are still found in older installations in industry (as a motor-generator set for speed control of dc motors). 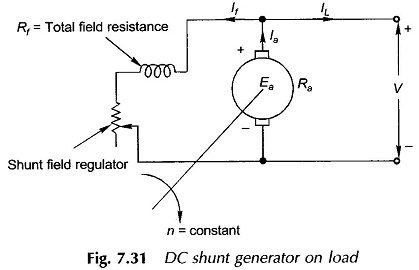 The load characteristic of a dc generator at a particular speed is the relationship between its terminal voltage and load current (line current) and is also termed as the external characteristic. The internal characteristic is the plot between the generated emf and load current. In spite of fixed excitation, Ea drops off with load owing to the demagnetizing effect of the armature reaction (see Sec. 7.5). As the voltage drop is caused by magnetic saturation effect, it increases with load nonlinearity. The internal characteristic (Ea IL) is shown dotted in Fig. 7.30. 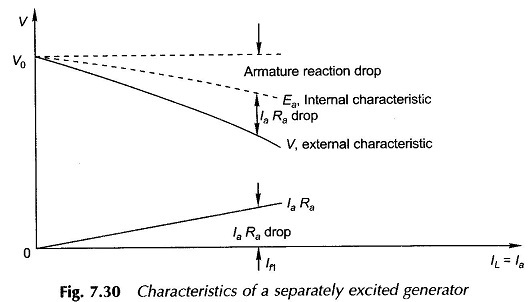 The external characteristic differs from the internal by the armature voltage drop /aRa which is also shown in Fig. 7.30.
can then be obtained by a load test with total field resistance remaining fixed in the process. 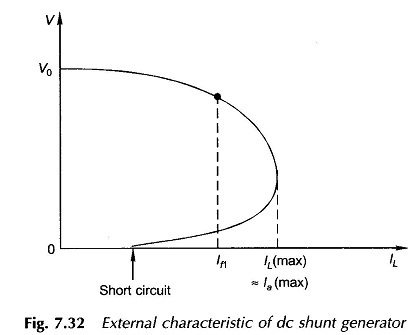 The terminal voltage drops off much more rapidly with load in a shunt generator than in a separately-excited generator because of fall in field current with terminal voltage. The external characteristic is a double-valued curve with a certain //, (max) as shown in Fig. 7.32. The internal characteristic can then be obtained from it by adding laRa drop at several load points. As indicated in Fig. 7.32, the useful parts of the external characteristic is much before the turning point.